Debate Over High-Priced Orphan Drugs Spending Intensifies : Shots - Health News Researchers analyzing recent drug spending in the U.S. say that high-priced drugs for rare diseases aren't having a widespread or significant effect on overall health care spending. How big a deal is the spending on drugs for rare diseases? "We wanted to focus on the true impact of orphan drugs," said Victoria Divino, a senior consultant at IMS Health and an author of the study. 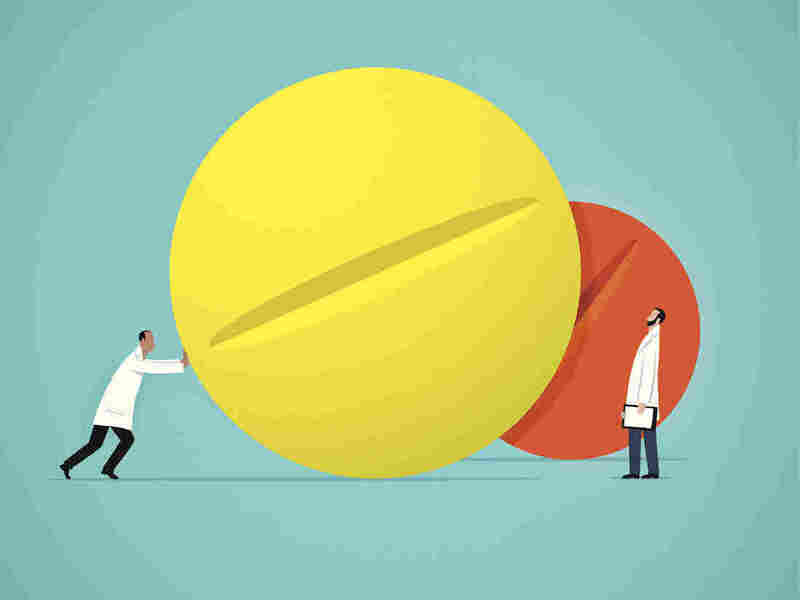 Researchers at IMS Health, a health care analytics firm, and drugmaker Celgene Corp. looked at U.S. pharmaceutical spending from 2007 to 2013 on more than 300 drugs that had orphan approval under the 1983 Orphan Drug Act. The Orphan Drug Act has long been considered a success for encouraging the production of hundreds of drugs for rare diseases. But the law's very success has raised economic concerns as the number of high-priced drugs for rare diseases has grown. The review found that orphan drug spending in the United States totaled $15 billion in 2007 and $30 billion in 2013, an increase from 4.8 percent of total pharmaceutical spending to 8.9 percent. The current study projects orphan drug spending will remain fairly stable as a proportion of total drug spending. That stands in contrast to other published reports that estimate orphan drugs will account for 20 percent of worldwide spending on drugs (other than generics) by 2020. The rise in orphan drug spending since 2007, Divino said, was caused by an increase in the number of orphan drugs approved by the Food and Drug Administration. The number of orphan drug approvals increased from 16 in 2007 to 33 in 2013, the analysis' time period. The Health Affairs article is the latest in a growing debate about the causes of high prescription drug prices and how orphan drugs may play a role. Drugs that win orphan approval have been cited for commanding premium prices, costing up to $300,000 per year or more, according to market research reports. The Orphan Drug Act provides a seven-year exclusivity period that blocks competition and other financial incentives to companies that develop drugs for diseases that affect fewer than 200,000 people. The pharmaceutical industry's interest in orphan drugs has escalated in recent years and, increasingly, doctors and researchers have raised questions about unintended consequences of the act. Celgene has been one of the top beneficiaries of the orphan drug law. The company's flagship drug Revlimid, which has orphan status for multiple myeloma and many other cancers, had sales of $5.8 billion in 2015. Evaluate Ltd., a London-based research firm, forecasts that Celgene will become the No. 1 orphan drug company in world, as measured by sales, in 2020. "When those financial incentives become sort of an investment opportunity to take advantage of the Orphan Drug Act. That's a huge, huge concern," said Clare Krusing, a spokeswoman for America's Health Insurance Plans, a national association for health insurance companies. AHIP released a paper in August that questioned prices on orphan drugs when they were being used outside of their approved orphan indication. For the Health Affairs paper, Divino and her team narrowed their analysis to orphan drug spending on drugs when they were used only on the rare diseases they were approved to treat under the act. The researchers used a database estimated to represent 98 percent of overall U.S. sales. "The number of orphan drugs is increasing but when we look at this line of the actual spending and the forecast as well ... yes, there is growth but it's a consistent linear trend," Divino said. Still, the authors' write, "in a broader context, drug expenditures are minimal when considered as part of total health care expenditures." Total orphan drug spending represented approximately 1 percent of total U.S. health care spending, according to the authors. Divino said the study's focus was on aggregate spending and they didn't look at the effect of orphan drug prices on individual patients. In an email statement, the pharmaceutical industry trade group PhRMA, said the study "reinforces that the overall impact of orphan medicines on payer budgets is relatively small and contrary to rhetoric, the percentage of medicines with both orphan and non-orphan indications is small." But AHIP and others say that not including the cost of orphans when they aren't used to treat rare diseases skews the pricing issue for patients. "It's not really the true orphans we worry about. It's about the other types of gaming and abusing the orphan drug act which drives up expenditures," AHIP's Krusing said. Researchers at Johns Hopkins Medicine called on lawmakers last year to close loopholes in the act, saying the law's financial incentives encouraged high prices and motivated companies to apply for orphan designation even when a drug is known to treat more common conditions. The paper, published in the American Journal of Clinical Oncology, noted that seven of the top-10 selling drugs worldwide in 2014 had received orphan status. Those listed included popular drug such as Crestor, a cholesterol fighter, and Humira, for rheumatoid arthritis and Crohn's disease. "There are a lot of factors I think that have come up in pricing in general, but what people are getting a glimpse of is the sheer greed," said Dr. Martin Makary, an author of the 2015 paper and professor of health policy at Johns Hopkins School of Public Health. Kaiser Health News is an editorially independent news service supported by the nonpartisan Kaiser Family Foundation. Follow Sarah Jane Tribble on Twitter: @sjtribble.